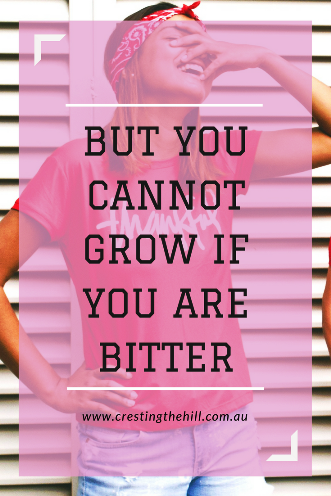 "BUT YOU CANNOT GROW IF YOU ARE BITTER"
I saw this quote recently on Pinterest (have I mentioned how much I love quotes, and how much I love Pinterest?) It was such a short little quote, but it struck a chord with me because I see so many people who are stunted in their lives because they allowed a hurt to grow and colour their outlook on life. I wrote a post very early on in my blogging days about people I refer to as Light Suckers. This type of person walks around in constant doom and gloom. Somewhere along the way they have been hurt or ignored or damaged in some way and they haven't been able to move on from there. It's like their lives are always under a raincloud - and they bring that dismal atmosphere with them wherever they go. My aim in Midlife is to bring a little bit of sunshine with me wherever I go - to let go of things that have hurt me or caused me to be upset and to focus on the good stuff. I'm so fortunate to have a life that is full of blessings - I just need to open my eyes and my heart and choose to look for all the good that is around me, and there's bucketloads of it! If bitterness stops you growing, then forgiveness and other positive actions are the fertilizer we need to help us flourish. There would be nothing worse than looking back on life and seeing that nothing had changed for decades, except that all the joy had been sucked away, and you had become a bitter and twisted old person - nobody wants that! I think the way to fight bitterness and doom and gloom is to turn your mind towards gratitude. When you pause for a moment and think of things in your life that you're grateful for, you can't help but be happier. Some people write Gratitude Journals, some people write three good things that happened to them each night before they go to bed. 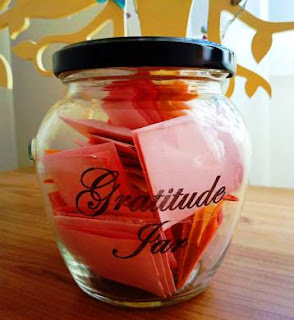 I'm not quite that prolific, but I started a Gratitude Jar at the beginning of the year and I try to put a slip of paper in each week that contains a few things that I'm grateful for. It only takes a moment but it makes my heart smile - and the jar is getting full - so many blessings! Gratitude, acceptance, forgiveness, and letting go are all choices we can make that move us forward in our lives ahd help us to grow into better human beings. Holding onto historical wrongs and choosing to nurture bitterness or resentment stops us in our tracks. We can't embrace new experiences if we're constantly mulling over old ones. I don't want to be the cranky old woman who remembers and recounts in great detail some wrong that was done to her in 1987! I might have a legitimate reason to feel hard done by but it won't change things, but it will cause me to be a person that nobody wants to be around. I don't want to be the person that people avoid because I've always got a sad story to tell. I want to be a woman who lives life well, who is growing and becoming the very best version of myself. 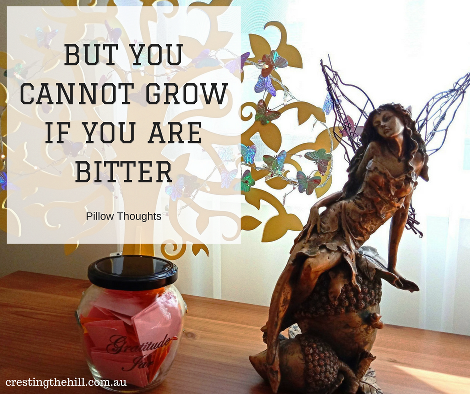 I don't want to stunt that growth by dwelling on past hurts (real or imagined!) I'd love to be thought of as someone who brings laughter and joy with them - not a raincloud of sourness and gloom. If bitterness is what holds us back from growth, then maybe it's time to put whatever caused us pain behind us and to move on from it. Maybe you have to address the issue, or maybe you can just choose to let bygones be bygones. We all want justice at times, but maybe if we're being the bigger person we can release that person from our thoughts and focus on all the good we have in our lives instead. What would you like to be remembered for? Will people talk about you with a smile or will it be with a roll of their eyes? Gosh...this is exactly what we've been talking about lately!! 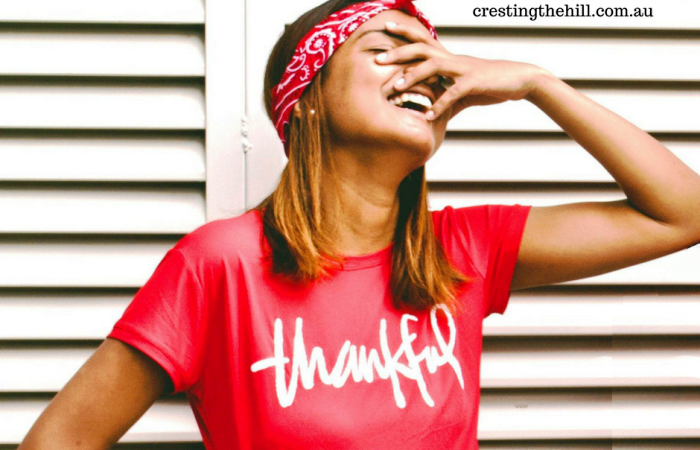 It's so true that gratitude can give us WAY more than we ever imagined. And I don't think we always realize how powerful our minds can be. If you think negative thoughts, you are negative and vice versa!! So so timely. I tend to not have the focus required to hold onto a decent grudge, but I'm still carrying the bitterness of the bullying my husband got from his empoyer of 37 years. Still. And yet if that hadn't happened we wouldn't be here. I found myself being very rude to a rep of the same bank on the phone today just because they work for that organisation & had to pull myself up & give myself a good talking to. That officer was not the bank & not part of what happened. I have to do the let it go thing. The funny thing is, if it had happened to me I would have let it go soon after it occurred, but the fact that it was someone I loved & I didn't have the power to control it? That's different. Let it go already. Jo I SO get what you're saying - my husband was royally screwed over by two people we considered to be our "friends" - one who was his boss and then gave his job to this other friend who had no qualifications - other than being prettier! This was a few years ago and I can still taste the bitterness I feel towards them. I chant "let it go, let it go" regularly and it doesn't eat me like it used to, but there is definitely a sense of forgive but never forget! I seem to be able to carry a grudge like a champion too Alana - but I'm working really hard on letting that stuff go. Things still sit in the back of my head, but they don't control my thoughts and I refuse to let them control my mood! We all know those bitter old ladies. I do not want to be one! I know a few Michele - and it's not pretty at all for a woman to be purse lipped and mean (no matter what excuse she uses). Everyone is hard done by at times but we all get to choose our rewponse and what we carry away from it. Just this morning, my eldest daughter and I were talking about choices. And that whatever you are looking for? You will find. If you look for the sun, sunshine will happen. If you look for the gloom . . .
That's exactly my point Diane - if you want to be offended or angry or bitter then there's every chance you'll have the opportunity to - because life isn't all sunshine and rainbows. But if you can look past the rubbish and see the good stuff - and focus in on that, then life is pretty darn good and you can't help but smile! I love your energy and spirit, Leanne. I wish I had had the wisdom you have when I was your age and younger. But, I can honestly say that I live my life with as little bitterness as possible. I have weak moments for sure when I ruminate over past insults and hurts, but these pass. I learned a long time ago that one effective strategy for letting go of bitter feelings is to avoid thinking about them because then you simply rehearse the bad feelings to the point that they become concretely embedded in your head. In other words, replace those bitter feelings with something that gives you pleasure to think about. I have been told by Men and Women that I wear my heart on my sleeve and My daddy taught me to always share a smile, you just never know what their going through. I hope that I am an inspiration to the ones I'm around. I have writing gratitude stuff but I really like the concept son a jar. Kind of takes the daily pressure off but you can read back and remind yourself of all the good things we truly have. 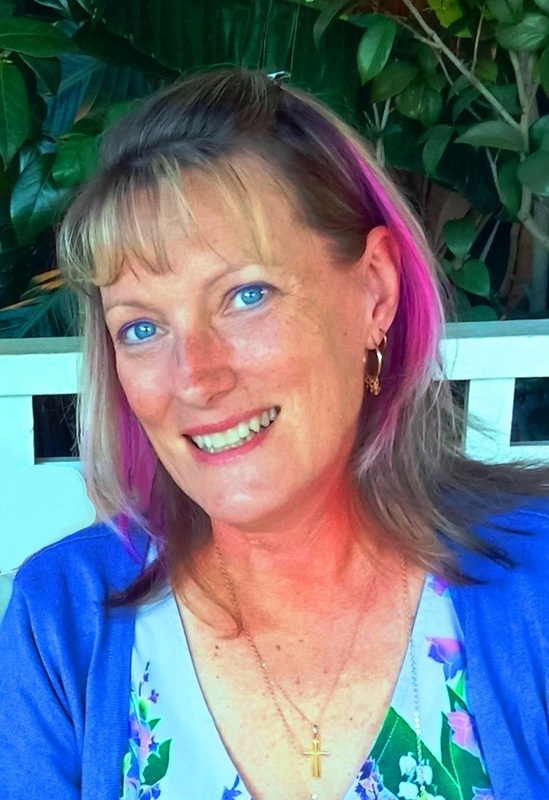 Hi, Leanne - I agree that the antidote for negativity is gratitude. Thank you for another post that makes us think! Hi Donna - if everyone could just stop for a moment and see how many blessings they have in their life, it'd definitely undo their negativity. "Count your many blessings, name them one by one...."
In 2004 I was in a job I hated. I would come home from work every night and complain about the people, the boredom, the environment, etc. By spring, I was tired of hearing myself groan so I decided to give up complaining for lent. Those 40 days changed my life. I may not share sunshine where I go (I tend to be rather serious) but I strive never to share gloom and doom. It isn't good for anyone, especially ourselves. Leanne - thanks for yet another thought-provoking post. I am not one to be bitter or hold a grudge, but I can be less positive than I'd like sometimes. Thanks for the reminder to always be grateful. I found it to be a great reminder of the damage it can do to hold on to negativity and grudges Janet. I have a few little niggles that rise up now and then (I'm a great believer in justice and hate to see bad things go through without due payment!) But it changes nothing to dwell - except hardening your heart - and none of us want that. Wise words Leanne. Daily we encounter bitter people. They're the person in the checkout line who's complaining about something or the crazy driver in the car that nearly hit us as they changed lanes. They're the ones who need to read your gratitude post, but I fear they're too focused inward for the concept of gratitude to register with them. I think I wrote this because I know I'm in danger of becoming a miserable old woman if I don't proactively work in the other direction Brenda! I expect other people to behave with the same standards I have, and when they don't I can feel my temperature rise - so it's about changing the focus and realizing I guess that some people are idiots (or in a bad place) and getting riled about it only impacts me - they're oblivious! I have a couple of things too Sue - they used to eat me up, but now they just sit at the back of my mind - I use them to remind myself that not everyone is honest or trustworthy and that I can move forward from that and not become like them. I'd love to let them go completely, but sometimes those reminders stop you repeating the same mistakes! Debbie you and I will have a blast one day when we finally get together for a coffee. Our kids will be so relieved they're not with us (save them a lot of eye rolling!) I am so using this stage of life of life to develop my quirkiness and owning the person that I am - not wasting it fighting battles that I can't win and that drag my spirits down! You're so right about the person who carries bitterness having to live with it 24/7 Sue - how awful would that be? When something upsets me it consumes me for a while and the thought of living that year after year is just awful. I think we need to experience pain and hurt, work through them and then move on. Living in anger, bearing grudges, restenting people, it's not a pleasant thought is it? Thanks for these important words, Leanne. I want to be the sunshine in the room, spreading cheer and sprinkling kindness. Of course, that doesn't mean I'm never sad or angry, but it does mean I address those emotions and move on. I focus on the good and feeling gratitude for the many blessings in my life. My mother is 80 years old today. She has every reason to be bitter. Her young husband was shot to death right in front of her when she was pregnant with their first child. She then went through two divorces and the sudden death of her youngest son. Yet, my mother is one of the most loving and joy-filled people I know. She is a wonderful example of endurance, thriving, and gratitude. I try to emulate her in that way. What a wonderful woman Christie - and what a fantastic role model to have had in your life. I am constantly amazed by people who choose to see the light, rather than being eaten up by bad experiences. It all comes down to choice and what we turn our focus onto - I know that I'd much rather be your Mum than a bitter and twisted old woman who walks around under a rain cloud every day. One of the reasons I started blogging was that I wanted to be remembered as more than just photographs. More recently, we've experienced a lot of loss, and I've been thinking so much about life, death, everything in between and beyond. I know that life can change in an instant and that it is important to make the most of every moment. Being grateful won't cure all ailments, but I know it helps. Light suckers, joy bandits, we have all encountered them, and from time to time, have actually been that person. Like you have said, it is all about choices; choosing to let go, choosing to forgive and choosing to be grateful. Leanne, you bring so much positivity to this forum and into our lives. I think you are going to need a bigger gratitude jar!! I call them Dementors too Suzanne and I'm in close association with one who I am constantly trying to "fix" and failing dismally. She just drags me down and leaves me wrung out. Avoidance is my only option - which is sad because she's actually a nice person and needs friends - but drives them away with her misery and gloom. I have met bitter and twisted even tried a friendship with someone until I realised that they had no intention of change - it was how they defined themselves. I do know that I have held grudges in the past but no longer, the practice of genuine gratitude shifted all that to the point that even when something not ok happens these days it really isn't a big deal. Indeed I am excellent at finding the silver lining and if I ever forget myself all I have to do is truthfully acknowledge all that is shared with me . I applaud your emerging quirkiness Leanne and tho' they may eye roll we are actually giving them the infinite possibilities of a fully embodied unique divine feminine Presence. hallelujah !!! "How they define themselves" is so true Sandra - I know a woman who has a complete story of who she is and how hard done by she is - most of it fabricated but she believes it and can't seem to change her narrative. I've spent years trying to rally her and point out the positives but it would mean she can't be the victim if she changes her story - how sad is that? To be defined by your victimhood! You hit the nail on the head again. Leanne. This is such an important message, most people here have come to terms with bitterness, but I know that many have not, so we will feature this post to give it more oxygen. Be looking on the next Blogger's Pit Stop for your feature. I find that living without bitterness is almost a constant habit to cultivate. I can forgive, but then some totally unrelated thing will trigger me to think about the event/person that I have forgiven. If I am not quick to kick it out of my mind the ugly head of bitterness could invade my mind again. The more we practice, the easier it becomes. I do like Sue's comment on giving 'free rent' what a great picture to use as a deterrent. This is a terrific post. I love what you have said and how it can really make people reflect. My yoga teacher told me that I was very angry when we first met. Looking back, I see that she was right, although I didn't realize it at the time. Letting go of bitterness takes a lot of vulnerability, but life has become even more amazing as a result.